September 1 | 2018. Ottawa Canada. Living Sculptures. | Peter M. Schloss | J.D. - Mediator. September 1, 2018. Ottawa Canada. Living Sculptures. Tonight my post will be short on narrative and long on images. 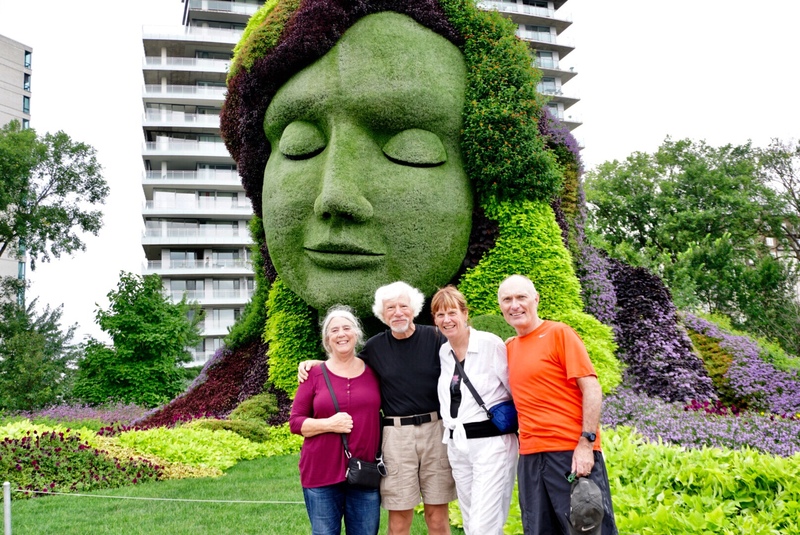 We toured Ottawa’s “Mosaiculture Gatineau 2018” an outdoor garden spectacle that presents 45 larger than life sculptures formed from wire and metal underframes that support plants that are arranged to complete each art piece. The exhibit covers acres of ground and is accessed by walking a 1km long path. Over 5.5 Million plants from over 200 separate species are involved in the endeavor. Last year over a million visitors toured the exhibit, a number certain to be eclipsed this year. Among the works was a 100 ton “tree” that presents 56 endangered species of birds in flora art. A huge head of a woman who’s extended arms present a waterfall on her right and a calf on the left was the show’s favorite. And a particularly charming man planting a tree as art imitates life. Other images are presented at the end of this post. Another feature of Mosaiculture today were First Nation dances, one of which included audience participation (me and Nanci included). Finally, the glory of the day was celebrated at Oree du bois Chelsea, a world class dining experience in the forests overlooking Ottawa. The leisurely dinner extended to nearly 3 hours with each minute being a savored memory! ← August 31, 2018. Ottawa Canada. Capital of our Neighbor to the North. WOW!! That place looks amazing. I will have to put that on my bucket list!! Thank you for taking such wonderful pictures and for sharing them! WOW! You always find and share the most amazing places. Your travel book would fly off the shelves! Wonderful pictures–what happens when winter comes? There must be hours and days of work to plan and execute the gardens. Added to my ToDo list! Right after South Africa, Botswana, and Zimbabwe this fall and the Galapagos next June. Loving life! WOW, now that’s a ToDo list!! What a great array of figures! Awesome!! Pete and Christine…thank you for the for the gorgeous pictures. My hometown is 60 miles down the road from Ottawa on the St Lawrence. Look for Habitat in Mtl – designed by our own Performing Arts Ctr Moshe Safdie in 1966 – and certainly for the amazing Samuel Champlain history in QC. Love, love your blogs. I am so glad you are enjoying these!! Thank you. BTW, we REALLY like Canada.